online with our secure order form! 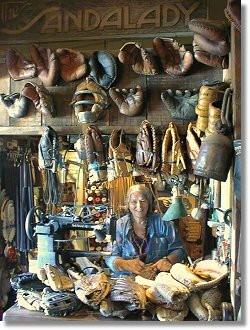 In the mid 1970s, while I was still a sandalmaker, people began bringing their baseball gloves into my shop for repair. Since then I have repaired and reconditioned thousands of gloves, at my shop and at baseball and softball tournaments throughout northern California and Nevada. My customers range from children to old-timers, and they all enjoy the game of baseball/softball and have a favorite glove that they love enough to want to repair. I've had the opportunity to talk to glove manufacturers, players, leather suppliers, and other glove repairers. I've learned a lot, about gloves and about people. Here are some of the things I've learned. A good glove does not have to be expensive. There are gloves that will give many seasons of satisfactory service for under $50. You can pay more, but more money does not necessarily mean a better, more serviceable glove. There are expensive ($90-$200+) gloves which may last one or two seasons, and there are inexpensive gloves ($35-$60) that can last for ten years or more with routine maintenance. Select a glove for the position you will be playing more often. Check for fit; a glove should feel fairly snug when adjusted. Check to make sure the glove adjusts to your hand. Allow for batting glove if you wear one and, except for hardball pitchers, you should wear one inside your glove. The batting glove will absorb most of the sweat from your hands, thus protecting the lining of your glove. Change the batting glove when it gets wet or rotted. Feel the leather. It should be fairly sturdy to sturdy. Sure, a stiffer glove will have to be broken in but once done, the glove will be serviceable for many seasons. The softer "pre-broken" gloves feel great, but most of them wear out very quickly and may be difficult or impossible to repair. The leather in these gloves is usually thinner and therefore weaker than that in a sturdier glove. The thinner, softer leathers tend to show signs of stress at the lacing holes in the web and fingers after a few months of continuous play. These softer gloves often have thin laces which cannot withstand the rigors of continuous hard play and will break after a few games. If these laces are replaced with a more substantial lace, this new lace can result in stretched or torn lacing holes because of the softer/thinner leather in the glove body. Beware of gloves that are marked with such nebulous terms as "specially treated leather" or "all leather palm". These descriptions may mean tissue-thin leather bonded to a fabric backing (a sort of leather veneer). Obviously this leather is not going to give years of service to the serious ball player. The "veneer" glove presents the same repair problems as the "pre-broken" glove; the body material is too flimsy for permanent repairs to be possible. "All leather palm" means just that. 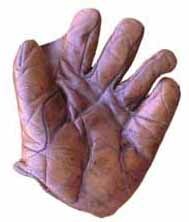 The palm of the glove is leather. The rest of the glove is usually not. Beware of plastic gloves—it is getting more and more difficult to readily distinguish between plastic and leather. Leather gloves will have "Genuine Leather" stamped on them; plastic gloves will not (but genuine leather can also include the leather veneers). When plastic tears, it is seldom repairable. Plastic gloves for kids are not recommended because they are almost impossible to break in. Oiling plastic does not soften it. Plastic gloves are not necessarily cheaper, especially if you have to buy a new one next season. Once you've chosen your glove, if it is not a "pre-broken" model, you will have to break it in. A good glove is like a good friend it takes a while to develop a good relationship. But with gloves and friends alike, the time and effort will be well rewarded. Most gloves are designed with built-in hinges which allow the glove to be opened and closed easily. The most common hinge is located at the base of the little finger pad, about 3/4"1 1/2" away from the heel pad. Normally, there is no pad in the hinge area; this allows the glove to open and close with minor resistance. The glove should close just like your hand at rest with the fingers folding at their hinge where they join to the palm. Some players prefer to break a glove so that the little finger and thumb tips come together. There are a few glove models designed to accomodate this break. These gloves usually have a series of vertical laces securing the heel pad. These laces allow the glove to fold across the heel. It is possible to break down the thick heel pad on the former glove type, but it is preferrable to buy a glove designed to break to your specs than to try to modify the break angle. I always clamp my jaw and shudder when a player tells me of the best way to break-in a glove. I have heard the most bizzare methods imaginable. Well, maybe not, but I have heard a lot of weird ones, and I've seen and repaired the results of many of these "best-ways." (Please do not send me your method.) I've relaced many gloves in my shop that have had bacon-crisp laces as a result of being oiled and put in the oven. This is how food is cookednot how to treat leather designed and manufactured to function as a tool! I've seen gloves that have been saturated in a bucket of used motor oil. This will make the leather more pliable, and heavy, and floppy and pretty much useless. There are gloves that have been coated with linseed oil. Linseed oil is made for use on rigid items, such as wood, to seal the surface and protect against moisture. When used on leather it seals the surface and causes it to become brittle and crack. Not all oils are created equal. Just because the label indicates oil, does not mean it is good for use on leather. Olive oil and other cooking oils will go rancid on the shelf as well as in your glove. Gloves that have had these oils used on them tend to have mushy leather. The laces break easily. The leather stretches and tears easily. Soaking is a popular method used for breaking-in a glove. Whether the soaking is done in water or oil, the leather, laces, and pad are subject to damage. There is a constant quest to develop ways to break-in gloves instantly. Many of these procedures involve the use of household appliances, such as conventional ovens, microwave ovens, washers, dryers and hair dryers, none of which should have anything to do with leather ball gloves. I read an article in a major sports magazine that quoted a professional ball player, who described pouring hot coffee with cream into the pocket of his glove. I don't remember if he used sugar, too, but why not? One other thing. Some players think that pummeling a new glove is the way to a quick break. Yes, it is. 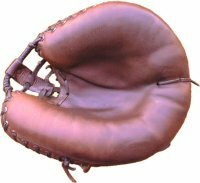 It is basically the same as using the glove for many games, only much rougher. I believe the glove will be better served, and will serve better, if this extra abuse is avoided. If you just catch balls to form the glove, you are training the glove and getting your timing down at the same time. Better for you. Better for the glove. When I break-in a glove, or mitt, I use a product that I've developed after years of trying almost every leather conditioning product on the market and some that weren't. Glove Stuff® is a cleaner and conditioner that contains lanolin, to soften and moisturize the leather so that spitting in your glovea disgusting practice, and damaging to the leatheris unnecessary. Glove Stuff® loosens even caked on dirt and grime, which can then be wiped off with a soft towel. It will not leave your glove greasy or oily. It does not attract dirt. Glove Stuff® will not make your glove heavy or floppy. It will not promote cracking or deterioration of the leather. Buy a lot. Give it as gifts! I apply a small amount of Glove Stuff® in the triangular area shown. I rub it into the leather until most of it has been absorbed, then wipe off the excess with a soft towel. Next, I fold the glove at the hinge and excercise that area until I feel it relax a bit. I then fold the glove and squeeze the fold with my hand so that a crease can be formed along the triangle line from the index finger side to the hinge. 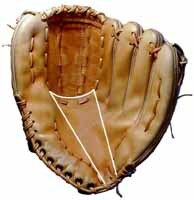 After setting this crease, I re-fold the glove and form a similar crease from the thumb side of the triangle to the hinge. The final step is to re-fold the glove so a crease can be formed from the center of the web crotch to the hinge. When finished with these steps you should be able to see three distinct creases fanning out from the hinge to the web crotch. After completing these steps (about 20 minutes) put the glove on your hand and close it a few times. You should be able to feel a difference in the way the glove responds. The more you repeat these excercises, the more responsive your glove will be. I may reapply some Glove Stuff® in a few days, but it is not necessary to use it in excess. I do not apply it to any other areas on a new glove. New leather should be clean and moist from the factory. Now I did have one customer who told me his best method for break-in and, after preparing myself for the worst, was delighted to find it made excellent sense. It's fast, too. He conditions a new glove then goes to the batting cages (at an off-peak hour, please, there will be fewer distractions and less chance of injury). He buys a bucket o' balls to catch, not to bat. He says that after one session the glove is game ready. Makes sense to me. Try it. The most important part of caring for your glove is to recognize that leather will deteriorate if subjected to repeated exposure to moisture and heat (i.e., the sweat from your hand and the warmth of the interior of the trunk of your car). Saliva will also result in damaged leather, so DON'T SPIT IN YOUR GLOVE. It's a pretty good idea to keep your glove away from the dog, too. 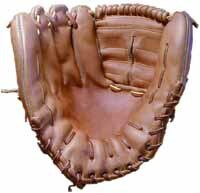 Leaving your glove out in the weather will ruin it, as will putting it away wet from perspiration. Always wear a batting glove under your baseball glove (unless you are a baseball pitcher); this absorbs the sweat from your hand. When your batting glove gets wet, change it. This will add years to the lining of your glove. When your glove gets wet, dry it with a towel or soft cloth, and leave it exposed to room air for a few hours until the lining is dry. After it dries, use a little Glove Stuff® to moisten the leather. When you put your glove away, it's best to put a softball in the pocket and wrap with a wide "magic" rubber band. I'm often asked whether frequent oiling is good for gloves. After years of repairing gloves, I say no. This does not mean no care is necessary. My experience has shown me that in glove care, as with most other things, moderation is best. When you do lubricate your glove, it's important to choose the right stuff. I recommend Glove Stuff®. CLICK HERE TO ORDER ON OUR SECURE SERVER! I call this a tune-up. This should probably be done at least once a season just so you can check the condition of the glove. I offer it as a service, for a (small) price, but you can easily do it yourself, and it might even be a bonding experience. 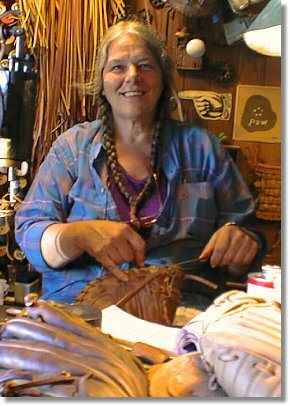 A tune-up involves tightening the laces in the fingers and web; retying any loose knots (square knots, please! ); and cleaning, conditioning and shaping the glove. Worn or damaged laces are easy to spot when a tune-up is performed. Another problem which can be observed during a tune-up is a blow out at the crotch of the index finger. This is a common occurrence because the glove manufacturers/designers have lowered the finger crotches in gloves, which puts seams right where the ball impacts the glove. This constant battering results in seams bursting and then, if not repaired, a torn palm. If you find torn seams, split leather, or broken laces, be sure to have them repaired as quickly as possible. 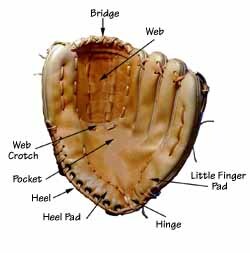 Playing with a damaged glove can damage the glove further and cause personal injuries and even errors. Copyright © 20002015 The Sandalady. Glove Stuff® is a Registered Trademark. All rights reserved. Original design and most photos by Sterba Co.
Site maintenance and updates by One Source Graphics.